Formed under the Government of India, in April 1957, Khadi and Village Industries Commission (KVIC), under Ministry of MSME, is a statutory body established to plan, promote, facilitate, organize and assist in the establishment and development of Khadi & Village Industries in rural areas, in co-ordination with other agencies engaged in rural development, wherever necessary. The commission is governed by the Act of Parliament (No. 61 of 1956 and as amended by Act No. 12 of 1987 & Act No. 10 of 2006). ‘Buna’, the brand started by Pallavi Shantam in 2017, gave an innovative fashion direction to traditional Khadi. Calling her collection as the “Time Whisperer” that was heavily rooted in the Japanese Wabi-Sabi concept, the designer brought imperfections to the forefront in a stylish form. Pallavi developed the collection with Jamdaani, woven stripes Khadi with Zari made by weavers from Burdwan West Bengal. While some of the striking creations were in Khadi Silks, a jacket in wool and 200 count Khadi was the arresting piece. Aiming to bring Khadi to the global platform, Pallavi gave a luxe image to the fabric, thus making it apt for a more sophisticated and stylish audience. With Khadi’s hand spun and woven history in the limelight; the ‘Buna’ label highlighted the imperfections of the fabric by adding patchwork to create new textures. Additionally, there were block prints of nature in the form of flora that were placed in shadowy forms to create an air of mystery. Shades of pale pink, black, white and yellow were the main hues for the fabrics. Delicate flowers, buds, leaves, berries and hedgerow appeared periodically on sheer Khadi silks and muslin. The almost rural, bucolic, pastoral, setting with faded blooms gave a vintage feel. The appliqué embroidery had a marked home grown feel that exuded a certain sense of calm. The silhouettes were softly flowing as the midis; bias cut minis, fluid maxis and languid creations moved in perfect harmony on the serene models. The “Time Whisperer” collection in Khadi, by Pallavi Shantam’s ‘Buna’, not only created a serene, bohemian, mood for the wearer, but also offered a Zen like quality. Saloni Sakaria’s ‘The Third Floor Clothing’, had a definite idea of how Khadi should be showcased. Maintaining the brand’s characteristic design elements intact – that included layering and androgynous silhouettes - the collection presented in trios of long/short tunics, pants and jackets gave a new style dimension to the fabric. There was a hint of modesty and decorum in the ensembles with the addition of experimental embroidery and surface techniques. The colour card was restricted to deep hues like red, blue, maroon, peach, dusty pink with tone-on-tone stories, which were favourites of Saloni. Khadi silk formed a major part of the collection, with occasional Khadi cotton entries. Staying true to the layering of the trios, Saloni offered a combination of sheer and opaque that had possibilities of interchanging the garments and creating varied styling choices. Fluid silhouettes drop shoulders for tunics and kurtas and the long and short lengths appeared in unison on the ramp. For lovers of Khadi ‘The Third Floor Clothing’ label by Saloni Sakaria had a wide range of garments that will appeal to their choices. Designer Lars Andersson is no stranger to the Indian fashion scene. Swedish by origin, and a resident of London, the designer launched his line in Brooklyn, New York. The inspiration to his collections has always been several cultures, religions, tribes and global citizens. He has held several knitwear shows in India that have earned him numerous accolades for their unisex appeal. Lars Andersson’s look has always been termed as totally minimal, timeless, urban and bohemian that infuses craftsmanship with modern classics, ethnic tribes and even religion. 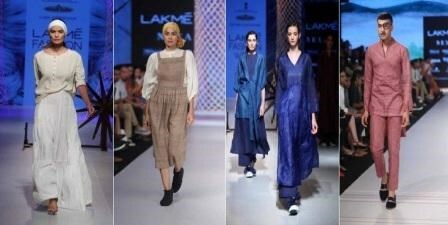 Creating his knitwear in Nepal and wovens in Kolkata, the Khadi and Matka collection by Lars was termed a fabric love story between these two textiles. The designer had developed the collection with 300-400-500 count Khadi and matka silk, which gave an interesting dimension to the fabric. It was fabrics in their purest forms with an inspiration that swayed between the East and West as well as masculine and feminine. Offering a line of gender-neutral garments, Lars remained true to his style sensibilities and displayed easy relaxed silhouettes that would appeal to buyers of all shapes, sizes and sexes. Drapes and bias fluid shapes ensured the timeless quality of the creations. The tiered skirts with shirts, strappy summer dress, tie-up jacket and belted soft coats with kimono silhouettes were the staples of the collection. Jewellyn Alvares one of the leading bridal wear designers known for his “Jule Bridal” label turned his gaze for the first time onto men’s wear for his Khadi collection called “Converge”. Working with pure rustic traditional Khadi with the inherent slub weave, Jewellyn used his women’s wear pattern making skills for men’s wear. Inspired by the poem “I Love a Lonely Winding Road” by Alora M Knight; Jewellyn used the words to guide him on the design path for his first men’s ready-to-wear collection. There were spirals, asymmetry, layering some controlled volumes that pushed his creativity to explore new avenues. Working with shades of beige, off-white, green, purple and mustard, Jewellyn worked on construction techniques instead of embellishments. The bias cuts merged into stripes, while asymmetric lengths gave the tunics, pants, shirts, jackets and coats an interesting angle in specially developed Khadi cotton that stayed true to the title of the collection. Different textures counts and weights of Khadi were the mainstay of the collection. Blurred stripe formations converged into slopes and were aligned into patterns and volumes. Playing with collars, Jewellyn brought the mandarin and shirt versions, but extended them or reduced the look to half the style. The round and ‘V’ necklines were prominent, while the coordinated sets were ideal men’s wear. Although the trousers were classic and narrow, the lengths were flexible but the fusion, contemporised, versions of the trench coat merged with the sherwani or bundgala, offered experimental options.